I love Indian curry dishes. I created this recipe as an attempt to replicate a dish I can't even begin to pronounce that I order at a local restaurant. Although not authentic in the ingredients I chose to add, it comes close in flavor. I tend to sneak a lot of vegetables in my curry dishes because it's a way to get my family to eat them. Now if I could only make authentic nahn bread I would be in chef heaven. I use my food processor to do all the chopping, but you can do it by hand. In a medium sauté pan over medium high heat, melt the butter. Sauté all of the vegetables except the tomato until they are soft, about 2 minutes. Pour the vegetable mixture into a crock pot. In the same sauté pan, brown the meat on all sides. Add that to the crock pot. Mix together all the sauce ingredients and pour into the crock pot along with the tomato. Serve over rice or quinoa, or with fresh Nahn bread. *if you can't find garam masala in the spice section of the grocery store, you can easily make your own. Recipe here. 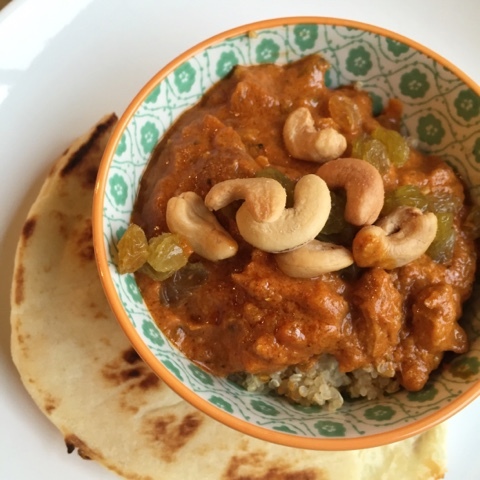 I tried making this recipe in the Instant Pot and it took 10 minutes! Follow these instructions if you want to try this method. I have to tell you though, it tastes better the next day as the flavors have more time to blend. Set the Instant Pot to saute, and brown the vegetables, spices and meat of your choice for about 5 minutes. Add all the remaining ingredients to the Instant Pot. Lock the lid into place and turn the Instant Pot to Pressure Cook High for 7 minutes. Once finished, turn the Instant Pot off, then perform a quick release to release the steam pressure. Once the valve button drops, unlock the lid and remove.